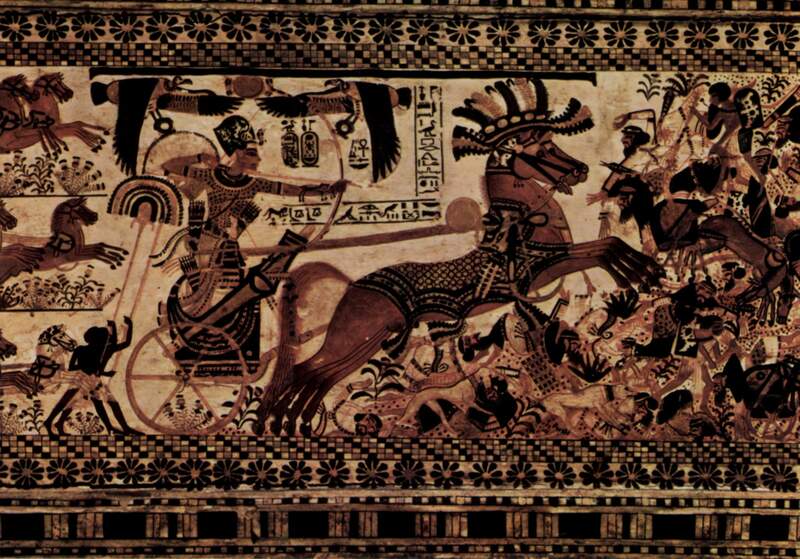 Pharaoh Tutankhamun (King Tut) fighting via chariot, 1300’s B.C.E. You’d think horses became important when people started to ride. But actually the horse reshaped civilization long before the first cavalry charge or mounted messenger. During the centuries following 2000 B.C.E., warriors of China, India, the Fertile Crescent, and other lands began riding chariots: light-weight, two-wheeled buggies pulled by teams of horses. The chariot allowed an archer and his driver to move at the speed of a horse, scattering hapless infantrymen before thundering charges. Faster-moving armies could cover more territory, so empires replaced the little kingdoms of the early Bronze Age. Chariots also led to a feudal structure in many kingdoms, where kings outsourced the high costs of charioteers and their gear to regional lords, who fielded armies of chariots — just as Medieval Europe’s feudal dukes and barons later fielded armies of armored knights. So why didn’t these Bronze Age warriors just ride their horses? They didn’t have a saddle stable enough to serve as a fighting seat. Falling off the horse, at the feet of your enemy, is not a good idea, and stable saddles didn’t come along until after 1000 B.C. It’s also possible few in the civilized world even realized horseback riding was practical during the Bronze Age. Barbarians on the steppes had been doing it for thousands of years, but to the lords of the urban lands, it may have seemed more a dangerous stunt than a mode of transportation. After all, before a horse gets “broken” — trained to be ridden — it goes crazy when anyone tries to sit on its back. So it’s often the rider who gets broken. Cavalry and horseback transport didn’t reach the civilized world until long after the age of the chariot lords — during the centuries after 1000 B.C. © 2011, 2015, 2016 by David W. Tollen. All rights reserved. I have always loved the history of the horse – having been brought up with Misty of Chincoteague and the horses from the Spanish Main. (LOL) But the history you mention here is obscure enough to have passed me by – thanks for the post! Betty, my recollection is that, in The Iliad, the heroes ride up the battle on their chariots and then get off to fight. It suggest that Homer didn’t really understand the chariot’s purpose, which makes sense, given that he wrote several centuries after infantry had supplanted the chariot lords. But it’s also possible that Homer was accurate, and his writing shows that the chariot had become an anachronism for the late Bronze Age Greeks. The Greeks may have been chariot warriors when they entered Greece from Europe’s northern plains. But then they gave it up, since Greece was a land of mountains and valleys, rather than plains, where chariots were of limited value. Yet the chariot would have retained great prestige, because of the connection to ancestral warriors and because it’s just so cool to pull up in a chariot. So Greece’s Bronze Age warriors may have stuck with their chariots whenever possible, while fighting on foot.